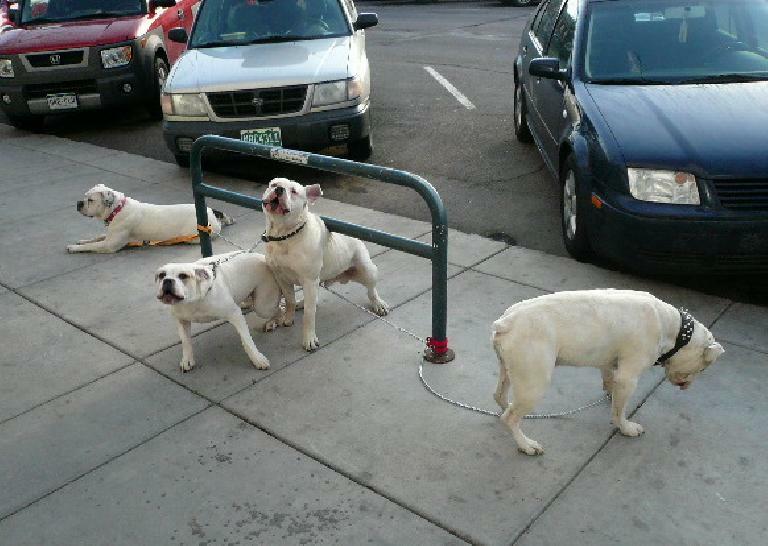 Fort Collins is a town that loves its dogs. Seemingly every one of my neighbors and pals have a furry, feisty, four-legged friend. When I run on the recreation trails around my neighborhood, every few minutes I’d see (and hear! ), say, a pup bouncing up and down behind a glass sliding door or a majestic terrier standing erect like a human with his front paws over the three-foot-high fences out here while barking to the clouds. Once in a while, one of these friendly yappers even join me on my run for a minute or so, trotting alongside while wildly wagging his tail—until he sees a more interesting subject, like a squirrel or something. Then there are the dog parks around the city. There are at least three, including the Spring Canyon Dog Park at the end of Horsetooth Road that was just completed in late 2007. These open areas, I imagine, make excellent training grounds for the dogs. Training for what, you might ask. 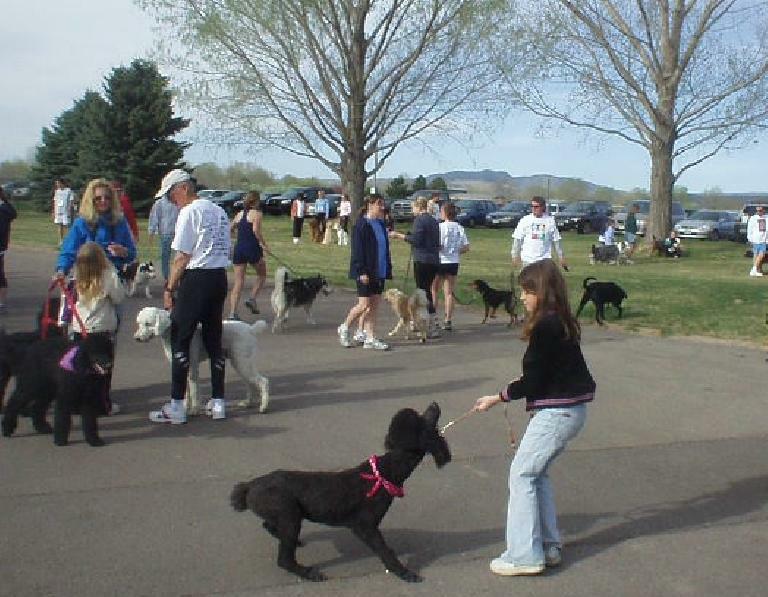 Why, the races out here specifically for canines and their masters, like the Fast and the Furriest 5k (I LOVE that name!) and the Fire Hydrant 5k. And now that spring is here, dogs are virtually everywhere: out in the yards, on the recreation trails, and even on the sidewalks in downtown. For example, below is a photo of some I encountered today while walking over to my favorite bicycle-themed coffee shop where I had Spanish Conversation Meetup tonight. Cute little fellas, yes? For some reason this photo makes me laugh! I stumbled upon your blog while looking up information about Fort Collins, and was wondering if you could help me. I’ve never been to Colorado, but have always dreamed of living there (love the mountains and the lifestyle). This you can’t find in New York! I want to live somewhere that’s close enough to the mountains, yet accessible to a large city for all of its amenities/options. However, since I don’t drive, I need to live in a big enough city/town as my “homebase”, so to speak. I thought Fort Collins would be perfect, but I need specifics from someone who lived elsewhere and now lives in the area to gain their perspective. 1. How pedestrian-friendly is Fort Collins? Can I walk most everywhere if I needed to? 2. I like the idea that the city seems very bike-friendly. About how far can you go on bike to explore the surrounding areas? 3. I know they have Transfort, the local bus transportation for the area, and I know it only operates up until about 7 pm or so (and earlier for certain routes), and not on Sundays. That seems rather odd (to me), since CSU is a major influence on the town. Your thoughts? 4. How would you say the job market is? I have only done clerical work for most of my life, but wouldn’t mind definitely exploring a new career. Any idea what the fastest growing industries are or where someone open to a new career could get their foot in the door? 5. I would need to rent an apartment. Any idea of where the good places to live are in Fort Collins? Thank you for any help you can give me regarding my questions, Felix. I’m enjoying your website.